The new update Clash of Clans 7.200.12 APK has been released and you can download the latest version for Android directly from this site. This is the newer version so you can update to get the best performance and more features. In the previous post we have shared some tips to play the game. In this section I will share about category of game players. There are 3 types of players: farmer, trophy hunter and passive player. I will explain each categories. Farming is defined as stealing Resource (gold / elixir), by stealing from other villages (multiplayer). So, the main goal for the opponent to attack the village is player steal resource as much as possible. The first attack was directed current gold Storage / elixir. They do not care about that at the time of attack to get “defeat” that reduces the number of trophy. The ultimate goal to find the resource. Trophy is the number of points gained when we beat the opposing village or can withstand an attack from the opponent in the game. So, trophy hunter is the opposite of the farmer. They prefer to flatten the enemy village / lead town hall resource than stealing. Usually such people are those who want to enter the ranks of top players. There is kind Clash of Clans ranking of number called a top player trophy. Trophy Hunter to be needed a lot of capital and time. Especially capital, capital here can be interpreted as real money. Because the average of top players that have the maximum village (all building is max level). And to get it we need a Resource all very much, and it all cannot be obtained from just farming. Moreover wall upgrades until level 11. So the solution is to buy gems with real money. Reworked and improved Lightning, Poison, Earthquake and Freeze spells! Total Destruction is now a Clan Wars tiebreaker! 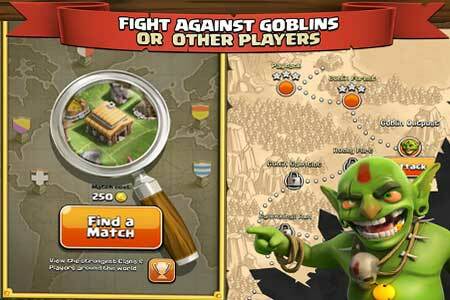 This game has everything including strategy and the ability to work with friends, while still allowing the player a chance to play alone without a clan and advance almost just as far and fight the goblin horde in a single player fight, and the achievements help steer new players in the right track.